The Web of Data is an inherently distributed environment where ontologies are located in (physically) remote locations and are subject to constant changes. Reasoning is affected by these changes, but the extent and significance of this dependency is not well-studied yet. 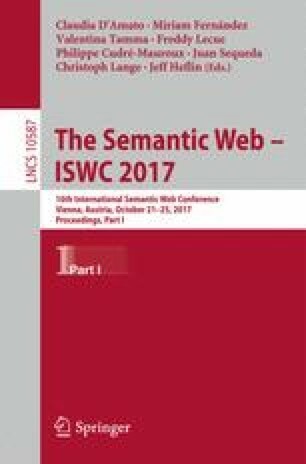 To address this problem, this paper presents an empirical study on how the distribution of ontological data on the Web affects the outcome of reasoning. We study (1) to what degree datasets depend on external ontologies and (2) to what extent the inclusion of additional ontological information via IRI de-referencing and the owl:imports directive to the input datasets leads to new derivations. We based our study on many RDF datasets and on a large collection of RDFa, and JSON-LD data embedded into HTML pages. We used both Jena and Pellet in order to evaluate the results under different semantics. Our results indicate that remote ontologies are often crucial to obtain non-trivial derivations. Unfortunately, in many cases IRIs were broken and the owl:imports is rarely used. Furthermore, in some cases the inclusion of remote knowledge either did not yield any additional derivation or led to errors. Despite these cases, in general, we found that inclusion of additional ontologies via IRIs de-referencing and owl:imports directive is very effective for producing new derivations. This indicates that the two W3C standards for fetching remote ontologies have found their way into practice. This work is partially funded by the Dutch public-private research community COMMIT/ and NWO VENI project 40 639.021.335.